When is a planet a dwarf planet? When visiting schools or delivering presentations via Skype, one of the most common questions I’m asked is “Do you think Pluto should still be called a planet?” If only my opinion mattered! My reply brings approving nods from my audience. “Deep in my heart, Pluto will always be a planet to me.” But the nodding stops when I go on to say "I understand why the International Astronomical Union (IAU) felt it was necessary to redefine what constitutes a planet." It is no longer enough for a celestial object to orbit a star and be larger than an asteroid. A planet must be round or nearly-round, with gravity strong enough to disperse celestial objects from its orbit. The IAU defines Pluto as a dwarf planet.While it is the right shape and does orbit the Sun, it also travels through an area where asteroids exist. Pluto moves through the Kuiper Belt, a zone of icy objects beyond Neptune’s orbit. Other dwarf planets include Eris and the former asteroid Ceres. Here’s some fun space trivia about Pluto and the planets in our Solar System. Pluto was classified as a planet for 75 years. 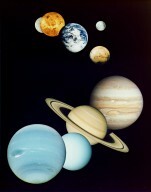 Venus, Uranus, and Pluto rotate in a direction opposite to that of the other planets. Mercury travels around the Sun at an average speed of 172,300 km an hour (107,000 miles an hour). Mercury’s core is made up of iron. The surface of Venus is a desert. About 64 km (40 miles) above the desert surface, winds blow at 426 km/hour (265 miles/hour). The upper atmosphere swirls 50 times faster than the planet rotates! Gently rolling hills, as well as thousands of volcanoes cover most of the surface of Venus. Some craters are produced by volcanic eruptions, while others are produced by impacts. When closest to Earth, Mars is only 56 million km (35 million miles) away, but its farthest point is 400 million km (250 million miles). The clouds surrounding Jupiter travel at different speeds, rotating faster at the equator than near the poles. Another moon of Jupiter, called J3, is only 40 km (25 miles) across. It is the fastest moon in the solar system, traveling 113,300 km/hour (70,400 miles/hour). J3 would only take a few minutes to travel over North America, from the Atlantic to the Pacific coast. There are always storms on Jupiter. It is not unusual for a Jovian storm to be 9600 km (6000 miles) across. Wind on Jupiter has been measured at 650 km/hour (404 miles/hour). Electricity flows back and forth between Jupiter and Io, which has active volcanoes that erupt with hot gas and molten sulphur. Wind speeds on Saturn can reach 1770 km/hour (1100 miles/hour). Uranus is tipped on its side, causing each pole to alternate facing the Sun. At times, this makes Uranus’s polar regions warmer than its equator. Neptune’s largest moon is called Triton. It is one of the coldest places in the solar system, with temperatures of –391° F (–235° C). Triton revolves in the opposite direction from the planet’s rotation and is the largest moon in the solar system to do so. Explore more cool space facts in Dot to Dot in the Sky, Stories of the Planets, published by Whitecap Books. Look for it at your local bookstore, online, or order an autographed copy from my website. Discover the Greek myths associated with each planet's namesake, along with astronomy facts and tips for observing the planets. Sci/Whyer Margriet Ruurs forwarded these photos of trees in Pakistan shrouded in silken webs after flood waters receded. 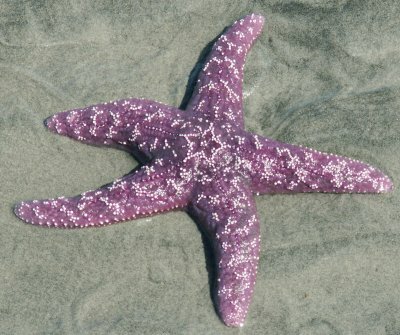 I fell in love with marine critters long ago when I was taking a summer-school biology course at the University of British Columbia. The highlight of the course was a field trip to Long Beach, on the west coast of Vancouver Island. We did intertidal transects: surveys of organisms along a line from the low tide line to the high tide line. I spent hours balancing on barnacle-covered rocks while trying to keep the waves out of my rubber boots, crouching over tidepools and watching for the movements of tiny crabs, struggling to identify and count anemones and clumps of seaweed -- and generally having a blast! How can you not fall in love with marine invertebrates? 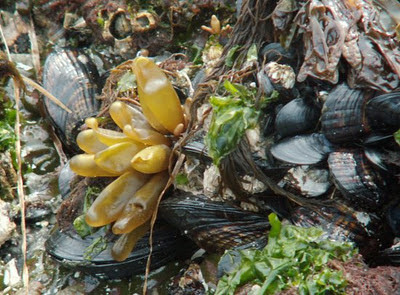 Gooseneck barnacles, sea anemones, crabs, limpets, worms, sea stars: the variety of ways marine organisms have solved the fundamental problems of eating, growing, and reproducing astonishes and delights me. When I started researching science books for kids, I fell in love with marine invertebrates all over again, especially when I was researching my book SPIKED SCORPIONS AND WALKING WHALES, which is all about life, evolution, and water. That's when I discovered a whole new group of species to adore. Over the last few years, scientists have been venturing deeper and deeper into the sea, either in person or via remote-controlled vehicles loaded with cameras and sensing gear. They've found organisms we've never seen before in habitats we never imagined. The discoveries just keep coming. Early in January 2012, pictures were released of amazing new creatures from a volcanic vent in the deep ocean off Antarctica. A few weeks earlier, it was other new species from the depths of the Atlantic. There are too many discoveries to list, so I'm posting some links where you can go and admire them for yourselves. Enjoy! It's September 7, 1896, at Narragansett Park in Rhode Island. The first car race ever held on a track in North America is about to begin. These newfangled horseless carriages are the biggest draw of the State Fair, and 50,000 people have crowed around the mile-long dirt oval to see them compete. The starter cries, "Now go, if you can!" and seven drivers throw their vehicles into gear. At once, Andrew Riker pulls into the lead, literally leaving his competitors in the dust. He blazes around the track at a shocking 24 miles per hour and comes "dashing over the finish line, his body bent forward as though holding the reigns over some spirited steed." As the car Riker invented rolls to a stop, the cheering crowd rushes forward for a closer look. That car, by the way? It hasn't got a gas tank. The Riker Electric Trap has leather seats and wheels that are spoked, like a bicycle's. It weighs 1500 pounds, more than half of which come from the lead-acid battery pack. At a speed of ten miles per hour, it can travel for four hours before the batteries need to be recharged. The car starts with the flick of a switch, runs quietly, doesn't rattle its passengers, and produces no noxious exhaust. And thanks in part to this race, it's about to launch Riker's career as a successful automaker, respected inventor, and the very first president of the Society of Automotive Engineers. 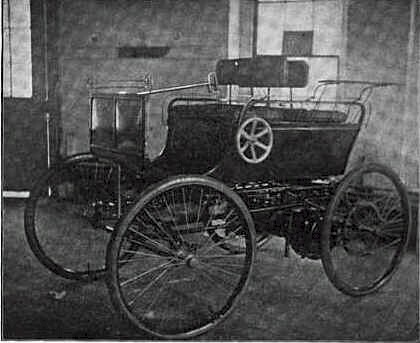 Due to a fire that destroyed most of his personal papers in 1900, we have few first-hand records of Riker's thoughts on cars in general and his own experiments in particular. We do know, however, that he believed electric cars were lacking something special - a battery "capable of deep discharges, but still not of excessive weight, and this requires some special type of battery." Despite serious effort, no one in Riker's day - not even Thomas Edison - could crack the battery problem. Electric cars, despite supporters including the King of Siam and Clara Ford (wife of Henry), were replaced with the faster, cheaper internal combustion vehicles almost everyone drives today. Thanks to rising gas prices, air pollution, and climate change, however, there's more interest in electric vehicles today than there's been since the 1920s. And thanks to some major battery breakthroughs, they might just replace gasoline cars - before we run out of oil. Stay tuned for Part 2 - The Battery Revolution! You can find more information about Andrew Riker and his vehicles here. More details on the Narragansett race are available in volume 1(11) of The Horseless Age, and in the September 19 and September 26 issues of Scientific American (1896). Check out this cool video on deep-ocean hydrothermal power. Research is naturally a big part of my life as a science writer. For my nonfiction books, I regularly get on-line, into the library stacks or on the phone to dig out interesting science-y information, and find out from experts how things really work. But what about when I write fiction? How much scientific research is required to produce a frothy adventure story? Nevertheless, I did want to make my plot, my scenery and my action as believable as possible. 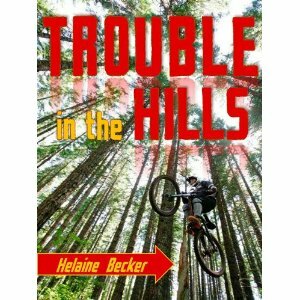 And I can tell you without embarrassment I have never mountain-biked in the Kootenays, or stumbled across a mad mama bear, human traffickers, or a corpse in a cave. But my gutsy and attractive teen protagonists, Samira and Cam, do. When I was writing the scene in which they find the corpse, I had a problem. In order to write it, I needed to know: ‘in what state was the body?’ Being a science writer, I could not just rely on conjecture and hope nobody noticed. I needed facts. To learn them, I turned to an expert in forensics, Dr. Shari L. Forbes. She’s the Director of Forensic Science and Associate Professor of Forensic Science and Chemistry at the University of Ontario Institute of Technology. extending to about 25m into the mountain side to a dead end. The cave would be at about 750 m altitude. So what does the body look like? Can you guess – or do you think you know – the answer to this gruesome forensic puzzle? If you do, please post your anwer in the comments section below. The most accurate answerer will win a signed copy of Trouble in the Hills!